People buy things online every day with no idea how much money they could be getting back for every purchase! Before you start shopping online, you should take a minute and check to see if the store you're about to use is supported by any of the popular cash back shopping websites. If you follow the link from a cash back site to your shopping destination, you'll get a certain percentage back of the total amount you spend. 1. Ebates – This is by far the most popular cash back shopping website. At Ebates, you simply browse for your store, follow their link, and you'll see the cash back go into your account within a few days to a few weeks after purchasing. They pay quarterly as long as you have $5.01 in your account. Note: I am an affiliate for Ebates. Please read my disclosure policy here. 2. Mr. Rebates – Mr. 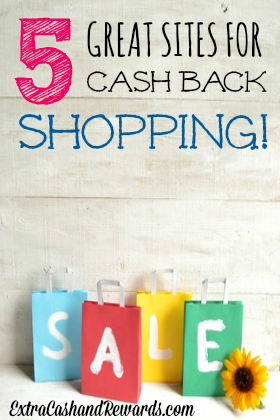 Rebates has cash back shopping at over 2000 popular stores online. You can get as much as 30 percent back for every purchase you make through their site. They give you $5 for simply signing up, and they have a showcase section with weekly deals. 3. Big Crumbs – This site has a nice, clean layout. One of the advantages Big Crumbs has over Ebates is that they pay monthly rather than quarterly.You do have to have $1 minimum to get paid. 4. Pennyful – Pennyful is a cash back shopping site that I just found out about. They support over 2,000 stores in several different categories. They have two options for payment: Fast Payout and Smart Payout. With the “Smart” option, you need at least $10 in your account. The “Fast” option lets you cash out with any amount. 5. Fat Wallet – Fat Wallet has so much more than just cash back shopping. It's a huge coupon/savings site as well. They support many major retailers and will pay you with check or Paypal.